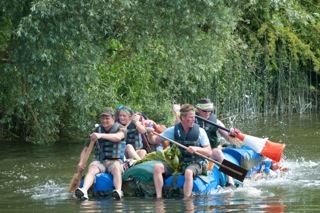 The Olney Duck and Raft Races was held on Sunday 7th July. It was a very hot day, we had 20 rafts take part and loads of people came to watch a good, competitive and fun race. 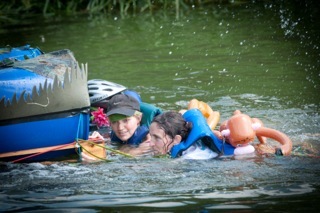 See the Raft Race Results. First, see this fun video from the Stimpsons Eves team. 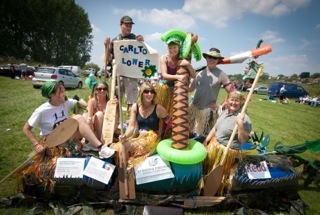 Inspired by Year's 4’s Wood Peckers summer project -‘The Rainforest’, and wanting to do something different and having a laugh, our PTFA at Carlton Lower School set out on a river challenge. We entered the Olney Raft Race. With a great amount of support collecting up recycled materials, trying out our building skills, one major rebuild, and two training sessions under our belt, our master crew of Alex Uncles, Rhonda O’Connor, Adam Ayers, Chrissie Lugsden, Amelia Boor, Will and Hannah Tongue, plus our star, teacher Gail Highton. We were ready to embark on the great water adventure, next door in Buckinghamshire. With our talented past student Alfie Templeman playing the drums to the crowd and the crew in fancy dress, we launched into the River Great Ouse for the 1 mile race... Sadly four of our recycled paddles broke straight away, resulting in three of the crew paddle-pushing the raft to the end. They kept in front of the Cave Women's Raft and came in 18th out of 20 but in great spirits! We didn't win the race, but we did win the award for ‘Most Entertaining Raft', with a shield for the school and £50 in prize money. Ending the day at the Fox Pub to witness another triumph; Murray winning at Wimbledon! A day that'll be remembered by all. There's even talk in the playground for a Viking themed raft for next year's race!